'Tis the season for Christmas holiday baking! But what's a vegan to do, with all the cookie exchanges, holiday baking parties, and fun family gatherings where buttery sweet treats are the focus? It turns out there's still a lot of baking to be done. With the 12 recipes below, you'll be proud to share the egg-free, dairy-free treats with family and friends throughout the season. Even if you're not vegan yourself, it's always a good idea to include a vegan option on your holiday dessert tray so everyone at your festive gathering has something to snack on. Happy holidays and enjoy! 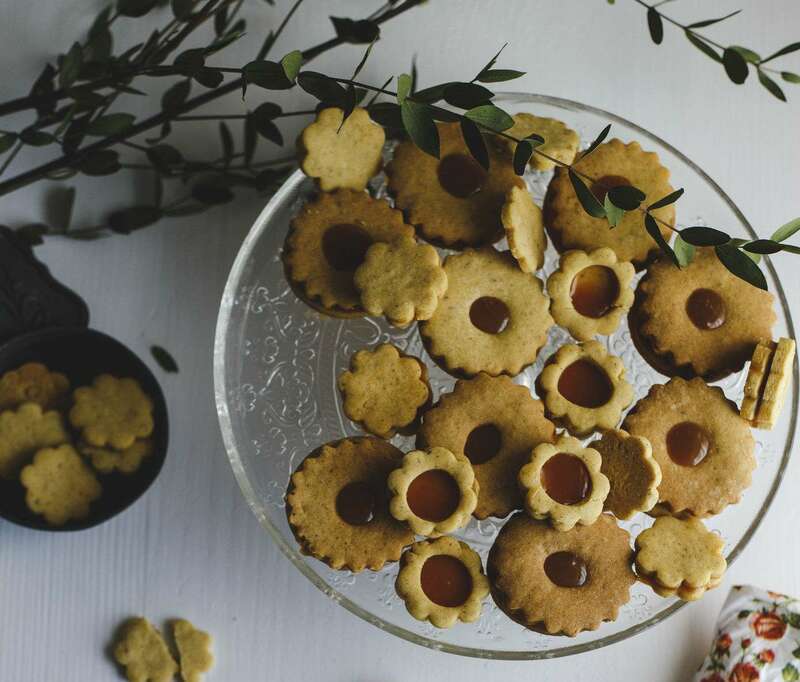 Festive Linzer cookies are made with one large and one small cutter to make a "window" for the raspberry jam to show through. You can enjoy eating them throughout the holidays and use them as edible Christmas tree ornaments, too! What would Christmas be without gingerbread cookies? This completely vegan recipe swaps in egg replacer to blend with the usual molasses, cinnamon, nutmeg, and cloves for super-soft, lightly-spiced treats. Let kids help you cut out the shapes and decorate them with faces and buttons for a fun family holiday activity. Russian holiday tea cakes are made with ground almonds and flour and look just like little snowballs on your dessert tray! The recipe requires only five ingredients—plus some extra confectioner's sugar to create the powdery coating. Try dipping them into your tea for a fun Christmas morning treat grown-ups can enjoy right along with kids. These spice cookies are a lot like gingerbread, but with added cocoa for the chocolate flavor. Cinnamon, ginger, and cloves add a rich warming flavor to these treats, which are guaranteed to fill your kitchen with a wonderful aroma. Go ahead and decorate them with a bit of powdered sugar on top, too. Shortbread cookies are a holiday favorite and this dairy-free recipe is a real find for vegans who crave their comforting buttery flavor, minus the butter. Once baked and cooled, you can decorate them with icing, beads, and sprinkles to create ugly sweaters, Santa Claus faces, or whatever else your imagination inspires. Egg-free, dairy-free, and completely delicious—that's these double chocolate cookies. Dress them up for the holidays with a sprinkle of finely-chopped hazelnuts or crushed candy cane bits, added just before baking. Sugar cookies are a Christmas essential. This recipe gets an extra festive zing from lemon zest, with silken tofu in the batter making them soft, moist, and irresistible. Kids will enjoy decorating these cookies with vanilla icing, rainbow sprinkles, or red and green baking beads. These spiced cookies are thick and chewy, just the way oatmeal cookies should be. They also smell wonderful while baking, thanks to a whole lot of homey fall spices, including cinnamon, ginger, and nutmeg. Originally a traditional German holiday treat, pfeffernusse cookies are enjoyed all around the world on Christmas day. Molasses, black pepper, brown sugar, and your favorite baking spices give them a scrumptious, fragrant scent that's perfect for enjoying with your Christmas morning coffee or tea. Making homemade vegan biscotti is easier than you may think, with sweet agave nectar replacing honey in this recipe. Add some dried cranberries to the cookie batter for a festive twist on the traditional Italian treat. You may want to make an extra batch—they're a lovely edible gift for friends, family, and teachers. Make your kids' holiday wishes come true when you let them munch on amazing "bacon" chocolate chip cookies while they're opening gifts on Christmas morning. The secret? 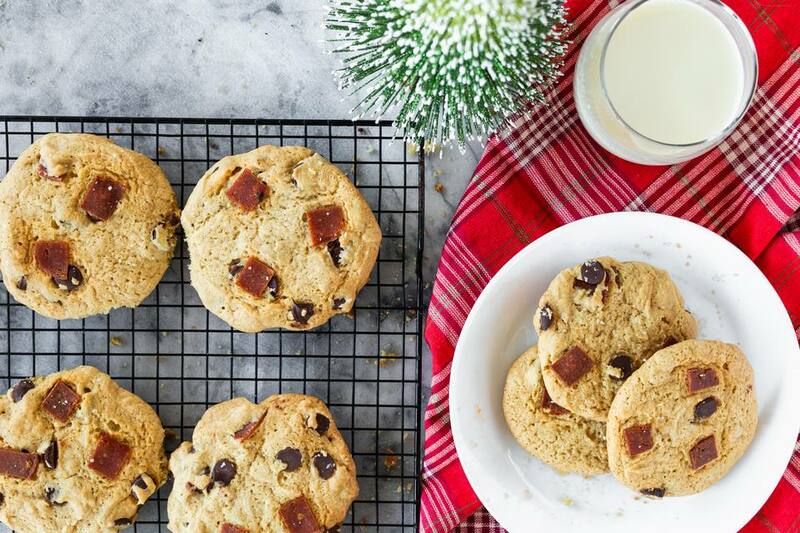 They completely vegan treats are actually made with veggie bacon and egg substitute, along with vegan chocolate chips, so you'll stay on Santa's "nice" list. These whoopie pie sandwich cookies—with a sweet, dairy-free cream cheese filling between two pillowy discs—are a crowd-pleasing vegan treat any time of year. Give them a Christmas makeover by adding some red food coloring to the batter for red velvet-style results.